I've been round a few places in Busan so far, during my months in Korea, but I've only ventured out the city a couple of times. I got to check another place off my list last weekend though, one that I wasn't actually that aware of it until a friend offered the spare ticket she had. 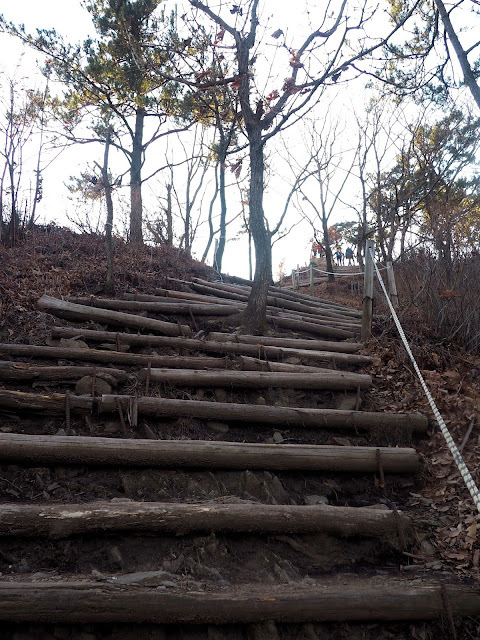 We were heading towards the Green Tea Plantation at Boseong, which was a 3 hour bus ride from Busan. It can be a little tricky to access by public transport, so we went as part of a trip organised by Enjoy Korea. 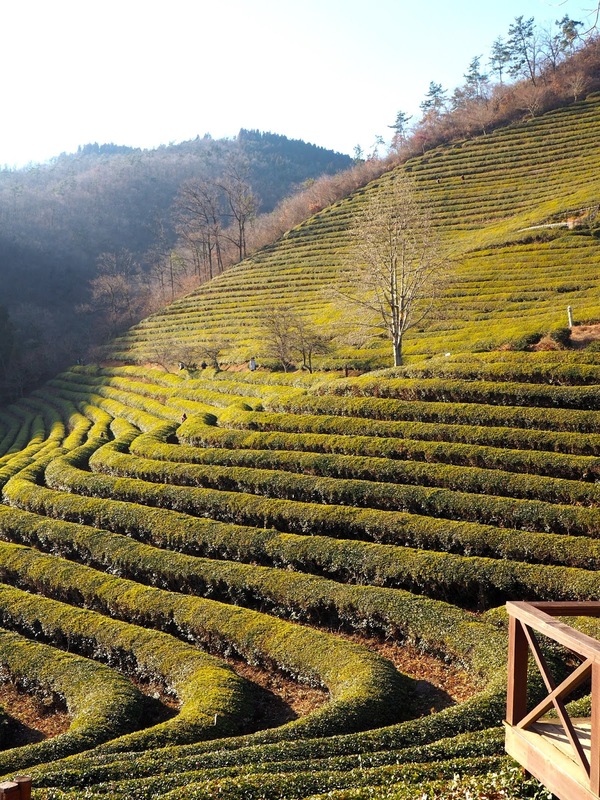 The tea fields are worth a visit anytime really, especially since green tea is so popular over here, but at this time of year they also host a Light Festival, through December and January, so our trip lasted the whole afternoon and evening, getting back to Busan at around 10.30pm. The tea field plantation has more than just the tea plants inside. It's located in a forest, so you walk through the quiet shelter of the trees first, passing by a large fountain, that wasn't in operation during our visit, and the various amenities, like the gift shops and restaurants. The smaller food stand sells everything green tea related - hot and iced tea, lattes, and even green tea churros - these are slightly green in colour, but don't actually taste much different. We passed by all of this on our way in, until we reached the tea fields themselves, which are located on a hillside. Line after line of plants winding up the hill makes for some good photo opportunities, and there's an observation platform halfway up the path for precisely this purpose, as well as a rest stop. You can wander through the middle of the field, along a path running parallel to the bushes, or take the staircase to the very top of the hill, which we decided to try. It's quiet a steep climb as you near the top, with large steps to get up, but the view from the top is fantastic, looking across the plantation, at the surrounding countryside, and even all the way to a nearby lake, and in the late afternoon light, it was ideal. We found a different route back down again, which led down the back of the plantation and through a quiet forest path, past a tiny waterfall and pavilion, before eventually emerging next to the restaurant and gift shop again. There are a couple of other forest walking paths to explore within the plantation, but the most popular option is the bamboo forest, located just left of the entrance. It's not a large forest in terms of the area it takes up, and only takes a few minutes to walk through, but it's remarkable to look at. It towered over our heads, taller than any other bamboo plants I'd seen. I've never thought of bamboo in terms of trees and forests, as I'd usually just call it a plant, but these were definitely tall enough to be trees. And with no branches on their stalks, they just shot straight up into the sky, and burst into a flourish of leaves on top. Looking up was certainly the best view of it all, and we took our time dawdling through and taking photos, before emerging on the other side (as mentioned, it really doesn't take long), and circling back around to the entrance again. We still had some spare time before it got dark and we moved on to the lighted area, so we returned to the central area of the plantation to get browse the gift shops (I didn't get anything, as I don't actually like green tea much - the fields just look pretty!) and get some dinner at the larger, upstairs restaurant. It got dark just before 6pm, when we were directed down from the main plantation to another field nearby, where the Light Festival was taking place. The entrance hosted plenty of food and drink carts, before opening up to the festival proper. It seems appropriate to have something so full of light and colour in the dark, cold winter months, and it would be easy to think of this as a Christmas display, but actually none of it is Christmas themed. 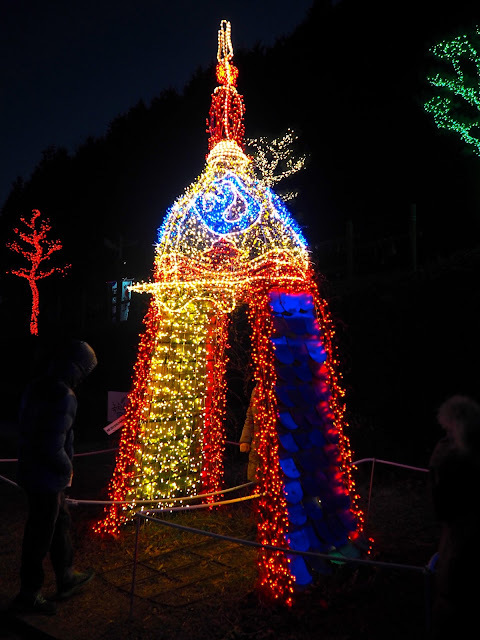 The title given to this year's display is "A Beacon of Hope", as is proclaimed above it all, across the hillside in a set of lighted letters. Another area of the hill also had lights creating a huge image of a ship on the ocean, which was best seen from a distance. 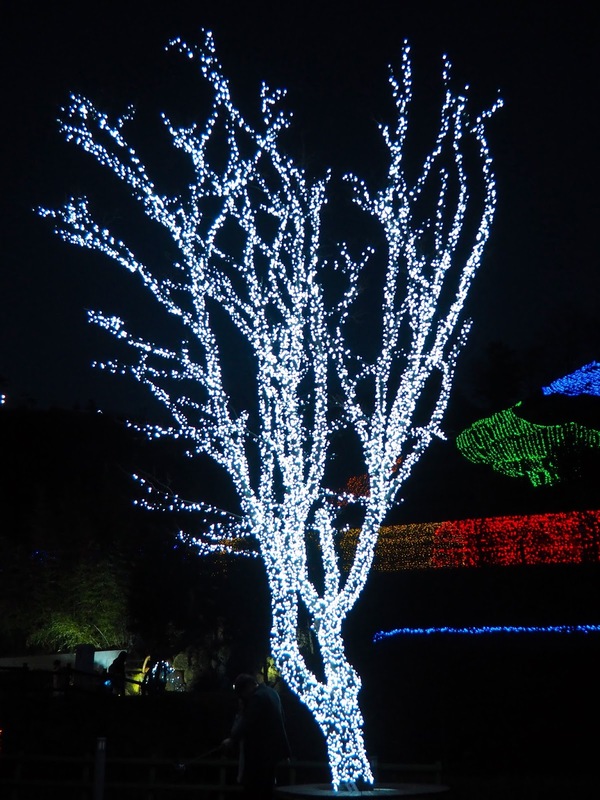 The ground level of the display has various individual displays, including a dragon, a group of dinosaurs, a set of hearts, a traditional-style helmet, and many trees decked out in different coloured lights. I think the dinosaurs might have been my favourite, as they were really quite cute, though my friend did also point out that the dragon's humps made it look a little like our native Loch Ness Monster. We wandered through all this, then through the temple structures, which had also been given lights along their rooftops. This brought us up the hill, and to one end of the massive lighted tunnel that wound its way down the hill, which had people flocking to it from the lower entrance (so we went through it going against the crowd). 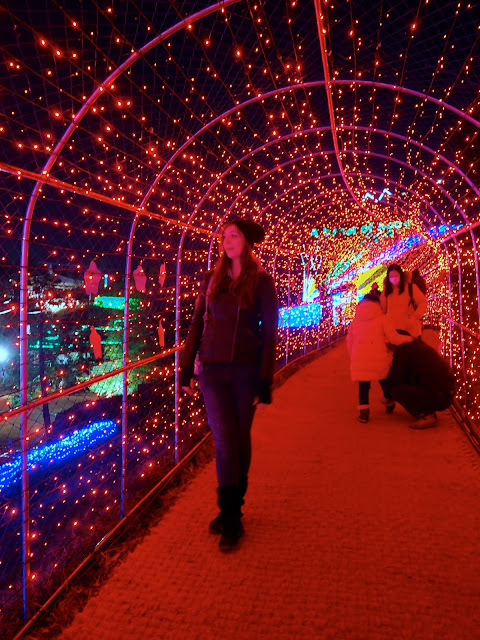 The colours of the lights changed on the way down, so we had some fun taking pictures under the different colours and seeing which ones we like best; the red felt very festive to me, the blue was like being in outer space, and the white was like the bright, cold winter weather. Naturally, there were plenty of other people doing the same, so we had to try to snap quickly in-between the waves of people coming up the tunnel, but we managed to get a few shots in. Once our time was up, we hopped back on the bus, but we still had one more stop to make before heading back to Busan. The Light Festival actually has a second display down by the coast, at Yulpo Beach, which was maybe a half an hour drive away I think. After the fantastical light tunnel we'd just been in, this display was a little less thrilling, but pretty nonetheless. The path alongside the beach had various displays, many of which featured animals, including a team of reindeer, various birds, and several dinosaurs (again!). The group featuring a stag, doe, and young fawn reminded me a lot of Harry Potter and his parents; I don't know if that was intentional or not! One of the most popular for photos, particularly for couples of course, was the giant pair of rings with diamonds perched on top. Next to the path, along the beachfront and amongst the trees there were more lights, creating mazes and paths, or simply adorning the trees, and at the far end of the path there was a boat positioned on the sand with lights strung across it. This was a smaller display than the one at the plantation, and if you were only going to visit one part, it would be that one, but I appreciated that our trip included both. It was getting late by this time too, and once we were all on board again, we headed back to Busan, making the journey faster this time, in just under two and a half hours. It was definitely nice to have organised transport like that, to spare the hassle of arranging things ourselves, and once we were at each site, we were free to roam around ourselves, and meet up again at the designated times. Occasionally we felt we had a little more time than we really needed, but I think it was to make full use of the day, since we had to travel pretty far to get there, and it did mean that we didn't feel rushed. All in all, it was a fun day out, and I'm glad I got to see another area of Korea. 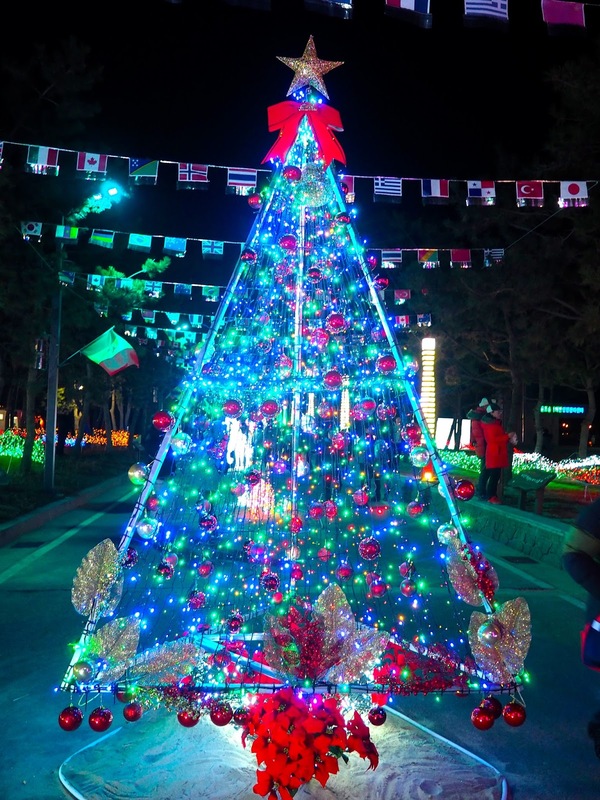 If you would like to visit Boseong yourself, there are tour options available through Trazy Crew, such as the Boseong Green Tea Festival. This is not the company I used, but I am an affiliate for Trazy.